Drinking sugary beverages is associated with a slightly increased risk for early death, a new study has found. Researchers used data from two continuing health studies begun in the 1980s that include more than 118,000 men and women. 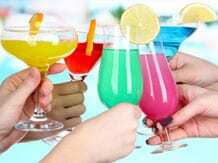 Among many other health, behavioural and diet characteristics, the researchers collected data about their consumption of sugar-sweetened beverages, including noncarbonated fruit punches. Over 30 years, there were 36,436 deaths. The more sugar-sweetened drinks people consumed, the higher their risk for death. After controlling for many health, behavioural and dietary characteristics, the research found that each extra 12-ounce serving of sugary drinks daily was tied to a 7 per cent increased risk for death from any cause, a 5 per cent increased risk for cancer death, and a 10 per cent increased risk for death from cardiovascular disease.